I’ve been feeling burnt out recently, and in desperate need of hang out time without children involved. The other day I got an email from my friend Holly Rosen Fink about a play she was the Associate Producer on, The Best of Everything. In the email she mentioned that this would be an awesome play for a “girl’s night out.” When I saw that, I knew exactly who I wanted to take with me; my soul sister, Donna. 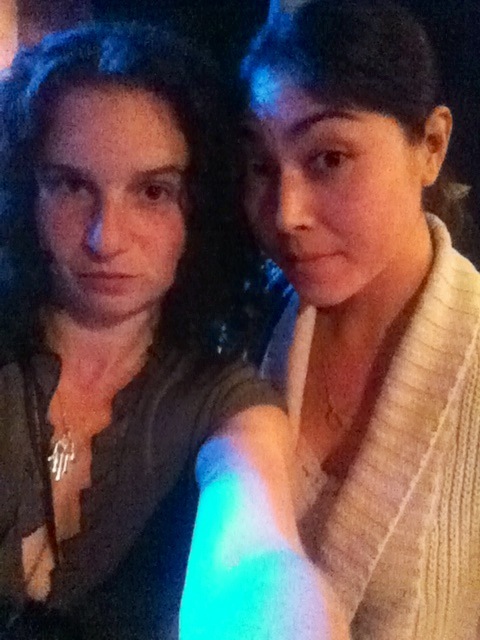 We’re both air signs; I’m a Libra and she’s a Gemini and together we make no sense and perfect sense at the same time. Tacos! 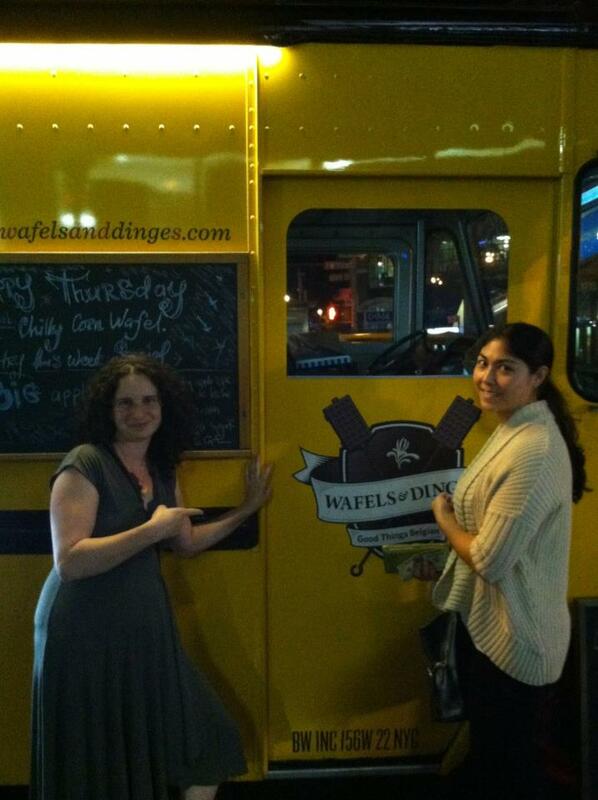 Donna and I planned to go see The Best of Everything, and then find the Waffels and Dinges food truck after the play to score some Belgian waffles with ice cream. We met at the Spring Street train station, found the Here Arts Center and settled into the front row to watch the show. 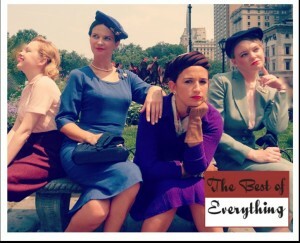 The Best of Everything takes place in the 1950’s. The setting – a publishing house filled with young secretaries, many of whom are preoccupied with getting married. The main character, Caroline, is an aspiring editor. A graduate of Radcliffe, Caroline longs to bypass the mundane day to day dealings of secretary life to become an editor. At the start of the play, Caroline is dumped by her dead beat fiance. She enters the world of publishing in order to heal from her break up. During the course of her office life she meets a group of women who she can commiserate with about men. Among the secretaries in the office, there’s a country bumpkin, an eccentric actress and an office yenta. I found this show to be charming, and laugh out loud funny. The characters were vastly different from one another and that made them fun to watch. I continually wondered what was going to happen to each of them. The show has multiple themes, one of which is the dichotomy of being a working woman versus settling down and getting married. It addresses how in the 1950’s these two roles did overlap, but rather they were mutually exclusive. The audience watches Caroline struggle with her ambition as well as her need to have a romantic relationship. Ultimately, one of those needs wins out, but you’ll have to see the show to find out which one! Donna and I really enjoyed the show. Afterward, we replayed some of the lines that made us crack up. 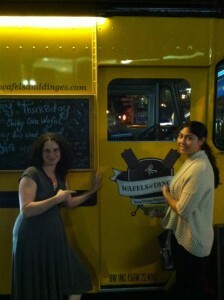 And then we got waffles! If you need a girl’s night out, this is it ladies. Click here to learn more about The Best of Everything. You know you want to...click it…click it now. Have you clicked it yet? **Disclosure statement- I have to write this. Yes I do. I got comp tickets to this show. But guess what? It was funny, I laughed. But I have to tell you that the tickets free. Yes they were, they were free.